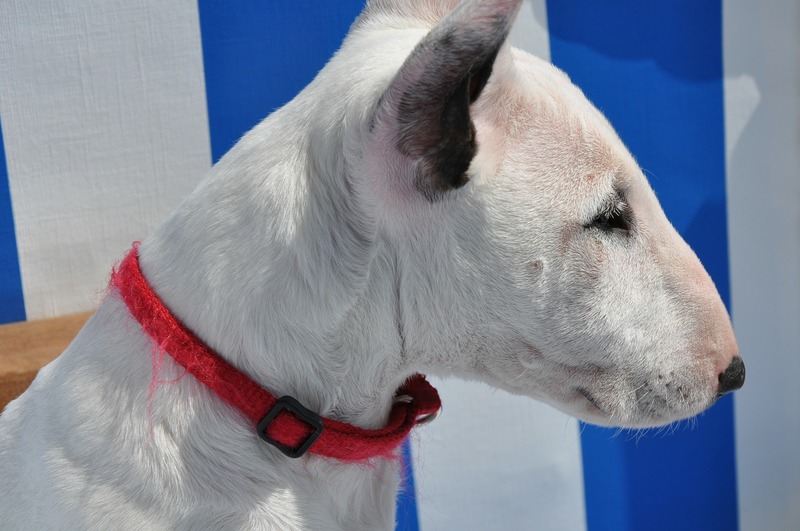 With a sturdy build and uniquely oval-shaped head, the Bull Terrier is a breed that really stands out from the pack. Their distinct egg-shaped head is one of the Bull Terrier’s most recognizable attributes. The top of the skull is almost flat when viewed from overhead with a broad nose and deep set eyes. In profile, the Bull Terrier’s skull curves gracefully downwards to the tip of the nose. Their erect, triangular ears sit high back on their flat skulls. Their unique facial structure features a deep under-jaw that is well defined. With an overall robust presence, Bull Terriers have compact, muscular bodies and they usually carry their short, sturdy tails horizontally. Their stocky legs are strongly built with straight elbows and stand firmly planted on their large padded paws. They have short coats that fit tightly to the skin with a slight sheen. 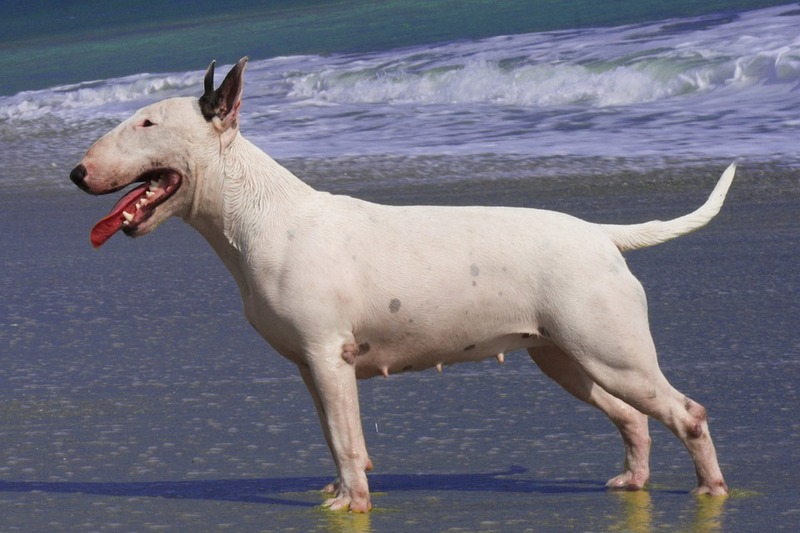 Bull Terriers can have wide variety of coat colors with white terriers usually being the first to come to mind. 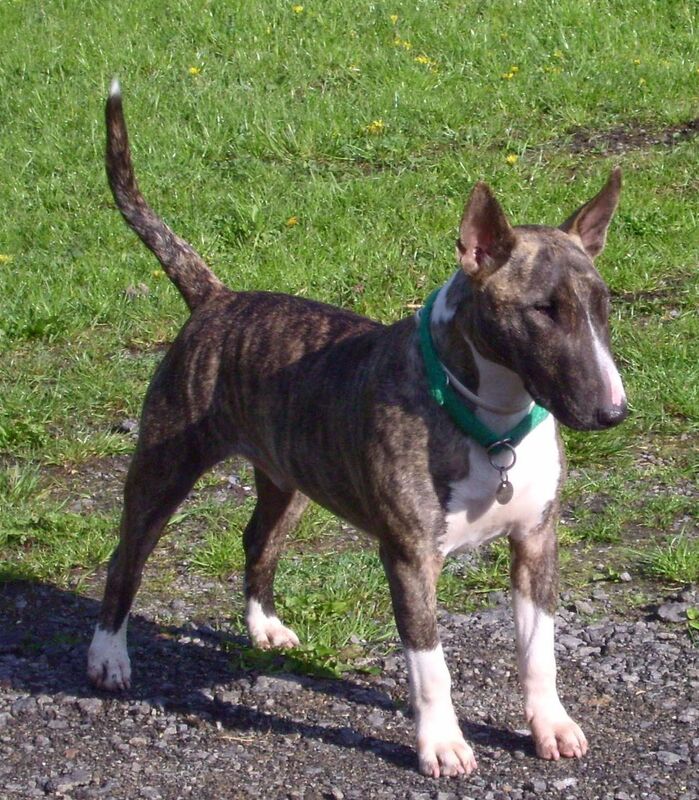 Bull Terrier pups can have a mix of colors and patterns such as black and tan, red, white & brindle as well as a variety of other brindle patterns. An average Bull Terrier will grow to be between 18-22 inches tall and weigh anywhere from 40-80 lbs, relative to their height. Healthy Bull Terriers often live to be 10-15 years old with proper love and care. Bull Terriers require minimal grooming due to their short coats and inherently glossy fur. Their fur has a hard texture which helps to prevent dirt and odor from penetrating the coat. Incorporating a hound glove or soft bristle brush into daily petting sessions will help eliminate dirt and any excess fur. Bull Terriers will shed considerably more during the transition between seasons and daily brushing during those times will really cut down on the amount of excess fur. An occasional wipe down with a damp cloth will usually keep them clean and smelling fresh. A light bath will also be beneficial once in a while, especially if the rambunctious Bull Terrier has gotten into a messy situation. They may file their strong nails down naturally during their daily activities, but may need a trim to keep them healthy. If their nails are clicking on the floor it is definitely time for a trim. It’s also a good idea to occasionally wipe out their ears to avoid wax build up. Notorious for their lively spirit and intelligence, Bull Terriers are high energy pups that thrive best with experienced owners. They are also highly social dogs who seek love and affection from their owners and often become extremely attached to their families. They do not enjoy spending long periods of time alone and are most happy and healthy with an active family or owner. They require lots of daily exercise and attention to prevent them from turning to destructive behaviors. Bull Terriers can be very innovative and will often find ways to entertain themselves and burn off their excess energy if neglected. Bull Terriers can be very rambunctious during playtime and may play too roughly with young children if not properly supervised. They make excellent playmates for older children and will love bonding with their family during play and training. It’s important to begin obedience training and socialization early in puppyhood to establish good behavior and habits. Since Bull Terriers have high prey drives, early socialization is essential in preventing any future altercations with small animals. Bull Terriers who are raised from puppyhood with other animals such as cats or small dogs easily learn to get along and even play with one another. Early socializing with other dogs as well as humans will also help curb the Bull Terrier’s innate suspicion and aggression towards strangers and other animals. Bull Terriers respond best to positive training methods and earning rewards such as food or toys for their good behavior. Verbal praise is also a very effective reward and will help strengthen the bond between dog and trainer. Bull Terriers should have their training begin early, while they’re still puppies, due to their rowdy behavior and love of rough housing play. Correcting them when they attempt to nip or grab is important to establish proper boundaries. They also have a strong prey drive and need to be socialized early in order to learn acceptable behaviors. Introducing them to other dogs early on will help them learn important social skills. Firm, consistent training tactics are crucial in order for obedience and training lessons to stick. If the behaviors are not reinforced or corrected as they occur, the trainer may accidently train the Bull Terrier with undesirable habits. 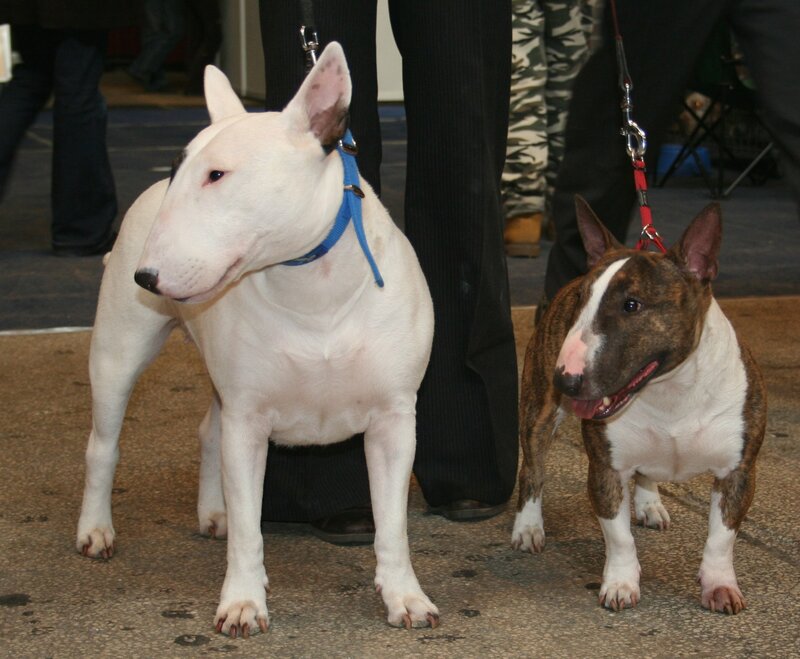 Today’s Bull Terriers descend from the “Bull and Terrier,” which was a dog breed that arose during the 1800s as a result of the cross-breeding of the Bulldog with terriers. This new breed was developed primarily to enter in dog fighting rings, such as bull pits, where dogs were supposed to attack a bull or bear that had been tied to a post. These dogs were later bred with the now extinct English White Terriers by James Hinks around 1850. He was looking to breed a solid white dog with a cleaner appearance and sturdier legs. The resulting dogs were known as the Hinks breed or White Cavalier, though these dogs still did not have today’s iconic egg shaped head. 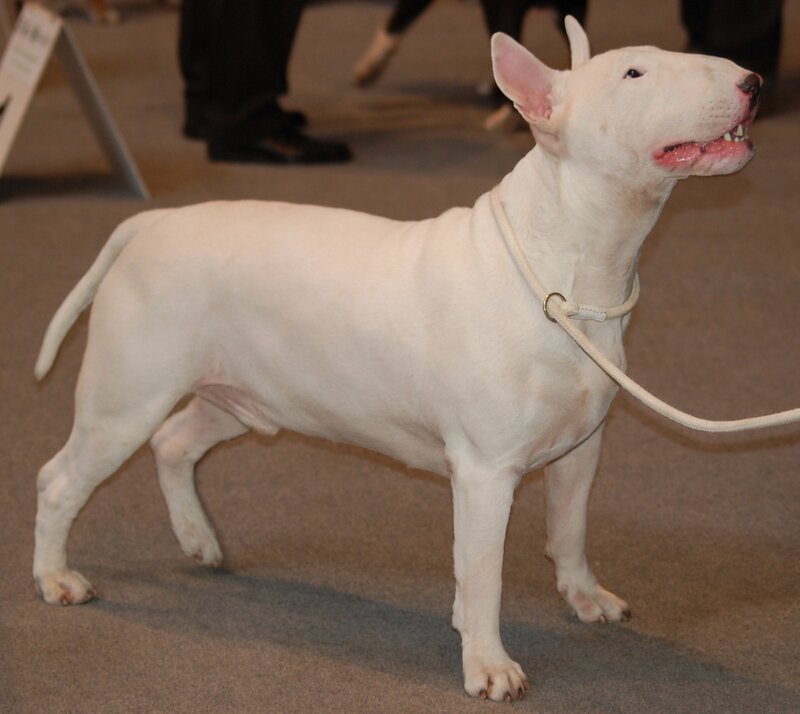 As further breeding techniques and crossing continued, the Bull Terrier of today emerged in a wide variety of colors and physical attributes. Depending on breeding history, some Bull Terriers may closely resemble Bulldogs while others reflect their terrier parents. 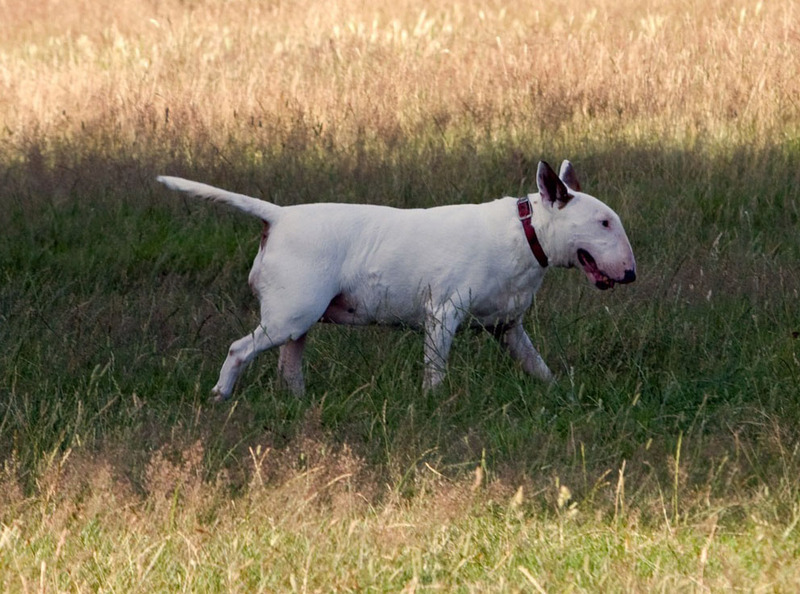 Bull Terriers have been utilized in many advertising campaigns for companies such as Budweiser, which featured a Bull Terrier named Spuds Mackenzie. The Bull Terrier is also the “bullseye” mascot for Target. The Bull Terrier has become a popular companion and makes a great addition to any family with the energy to keep up.